Before I talk about Wright, let me set off a huge sample size klaxon - Portela's stats are off seven legs in Hildesheim where he's played quite well. If you smash that Portela line based on the previous paragraph, you're insane. 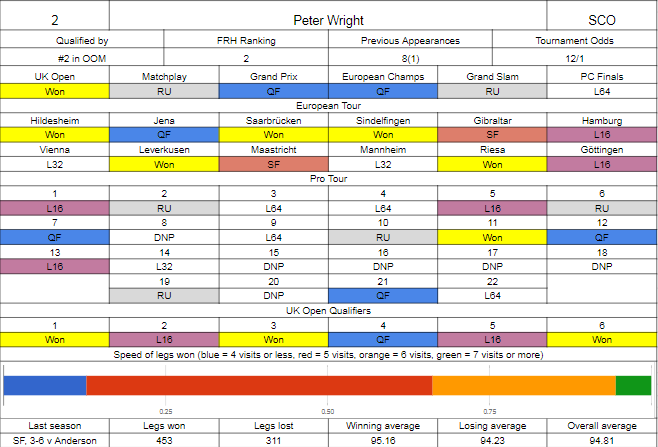 What a season for Peter Wright. Finally getting the major title he's been after, he should have added a second shortly after, only to miss a bunch of match darts in the Premier League final. Since that point I don't think he's been quite the same, but has still managed to grind out an excellent season - two other major finals, not really being able to stay close to Taylor at all in Blackpool, but being within touching distance of van Gerwen for long spells, getting as far as 10-10 before the Dutchman pulled away, after a great 16-15 win over Gary Anderson earlier in the day. On the floor he's managed to win nine events including five on the European Tour, making him one of the few players to have reached double figures in tournament victories for a calendar year, the only real disappointments being not sneaking past Mensur Suljovic in Dublin where the draw had opened up beautifully, playing well against Gurney in the European Tour quarters but not getting the rub needed, and a shocking loss against Steve Hine in the first round of the Players Championship. 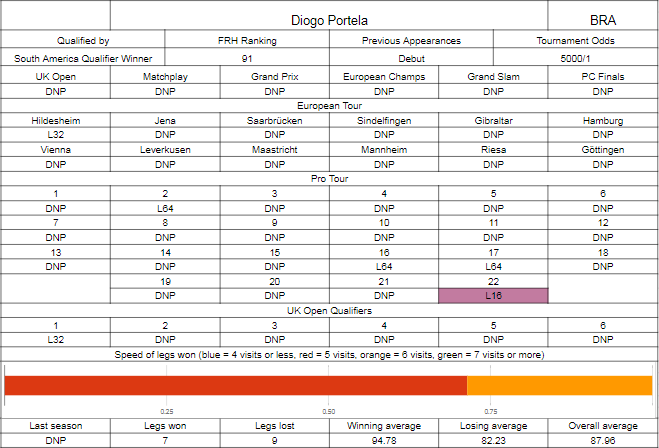 Portela's a Brazilian thrower based in London, who won the South American qualifier, which amounted to a Brazilian qualifier for all intents and purposes, and makes it into round one based on Order of Merit earnings. He tried to win a tour card at the start of the year, and while he didn't do so, a last sixteen run on the final day put him up enough in the rankings to allow him to try to qualify for European Tour events and play a few of the Pro Tour events. His win in Hildesheim was over Martin Schindler so potentially hostile crowds won't worry him too much, and he's also played in the World Cup where his side edged past two unknown Swiss players before Brazil got smashed by Germany, Portela winning his side's only leg over Max Hopp. His best run on the Pro Tour is his last event, where he beat Jelle Klaasen, Aden Kirk and Vincent van der Voort before going out to an in-form Ron Meulenkamp, so he is at least trending in the right direction. It's been quite the season for the Ferret, who's improved a ton from one of the last players in on the Pro Tour rankings last year, where he shocked Gerwyn Price before losing to Ian White. 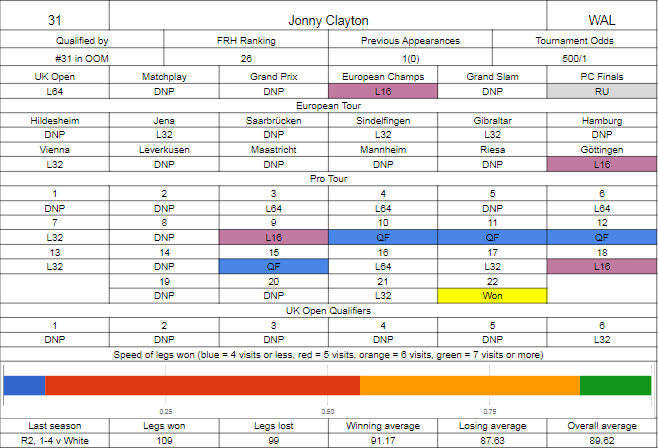 Clayton had an unimpressive start to the year, only making the UK Open on the last day, but he came through to the money rounds before losing to Jelle Klaasen, but picked things up in the next couple of months - going on a great run of deep excursions on the Pro Tour and qualifying for multiple European events, which gave him a platform to work on. He'd need to wait until after the summer break to start doing real damage though - from nowhere, he won the final Pro Tour event, beating James Wilson in the final and denying Gerwyn Price a revenge win in Göttingen, a result that got him to Hasselt where he got a favourable draw in Dimitri van den Bergh, and was able to stay close with Peter Wright until right at the death. Clearly confident, in the Players Championship Finals he'd take the next step, beating de Graaf, Price (again), Bunting, Beaton and Cross before running out of steam against van Gerwen in the final. Still, forty grand richer and with enough money to be seeded for this, he's got a chance to follow up last year's round of 32 appearance. Neyens is a name that seems to have been around for a while, but while he first appeared on people's radars three years ago when losing to Wattimena in the final of the qualifier he won to be here, he's still young enough to show up in the World Youth Championship, where he ended Max Hopp's chances of making it here before being crushed by Josh Payne. It was the Central European qualifier he won, beating Davy van Baelen (he of Lakeside last year) and Davyd Venken amongst others. He's won a Development Tour event this year and hit a nine as well, and did qualify for one European Tour event where he lost to Stephen Bunting. Lewis was seeded last year and is looking to make it to face Peter Wright in round two for the second year running, hopefully with better results as that was quite a steamrollering. Lewis needed to get through the PDPA qualifier after a very ordinary season, his best results coming early on with a good UK Open qualifier run putting him one round off the money to start, but he drew Paul Hogan and probably isn't even in the top three of most notable names that Hogan beat in that tournament. Since then he's not done enough to make any major events, the closest he probably came was in Europe, where four qualifications was OK, and he got through day 1 fine on each occasion, but lost to Suljovic, Cullen, Cross and Smith - two of them deciding legs. Elsewhere on the floor he's gone out first round on fourteen out of twenty-two occasions, which really isn't good enough for a player of his calibre. 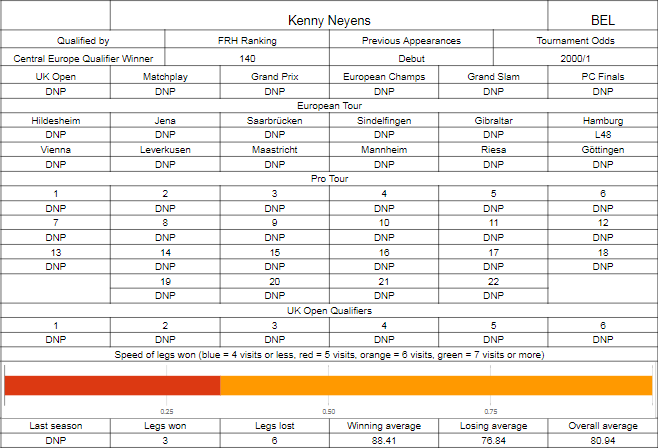 We lack a great deal of information on Neyens, and I think Lewis' experience should see him through this one, albeit maybe not with a bit of a struggle, I can easily see this going three sets. Clayton on current form shouldn't have too much of an issue with either qualifier, but he's not a big favourite. His stats in comparison to Lewis are remarkably similar, albeit Clayton has done his over a much larger sample size, and if I filtered down to the last three months rather than the whole season, there'd probably be more of a gap. 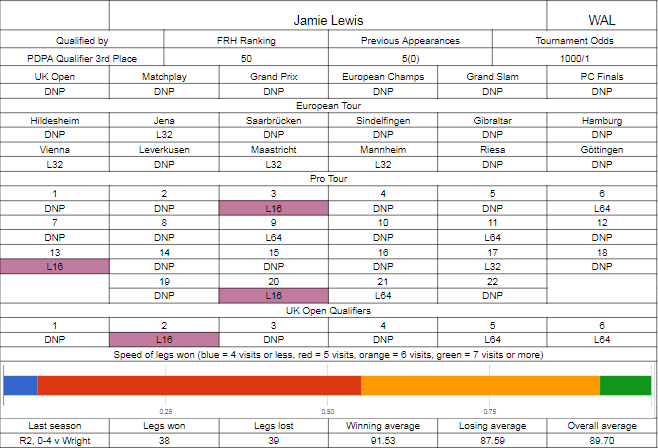 It'd also probably be more of a pressure game for Lewis, who's going to need to kick off next season well in order to retain a ranking anywhere near the top 32 he'd like to be at.